View this sample resume for a custodian, or download the custodian resume template in Word. Does your resume need some cleaning and maintenance? To be considered for top custodian jobs, resume expert Kim Isaacs says it helps to have a comprehensive resume that puts your skills front and center. For resume writing tips, view this sample resume for a custodian that Isaacs created below, or download the custodian resume template in Word. Jobs for custodians are projected to grow by 10% (or 236,500 jobs) from 2016 through 2026, which is faster than average, according to the Bureau of Labor Statistics (BLS). You'll find the highest level of employment for this job in the following states: California, New York, Texas, Florida, and Pennsylvania; and in the following metropolitan areas: New York City, Los Angeles, Chicago, Washington D.C., and Houston. As a custodian, you can expect to earn a median wage of $24,990 per year, or $12.02 per hour, according to the BLS. Additionally, you can search for custodian jobs on Monster. 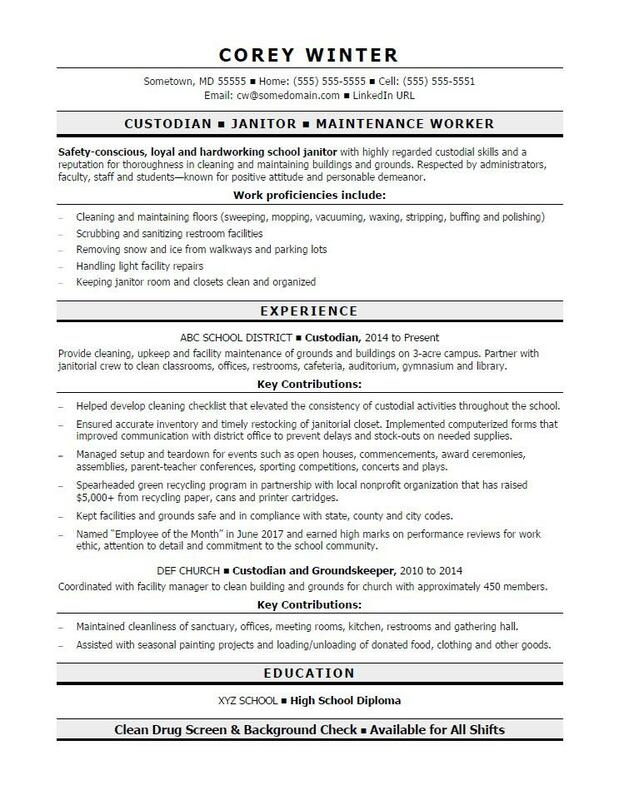 Safety-conscious, loyal and hardworking school janitor with highly regarded custodial skills and a reputation for thoroughness in cleaning and maintaining buildings and grounds. Respected by administrators, faculty, staff and students—known for positive attitude and personable demeanor. Provide cleaning, upkeep and facility maintenance of grounds and buildings on 3-acre campus. Partner with janitorial crew to clean classrooms, offices, restrooms, cafeteria, auditorium, gymnasium and library. Helped develop cleaning checklist that elevated the consistency of custodial activities throughout the school. Ensured accurate inventory and timely restocking of janitorial closet. Implemented computerized forms that improved communication with district office to prevent delays and stock-outs on needed supplies. Managed setup and teardown for events such as open houses, commencements, award ceremonies, assemblies, parent-teacher conferences, sporting competitions, concerts and plays. Spearheaded green recycling program in partnership with local nonprofit organization that has raised $5,000+ from recycling paper, cans and printer cartridges. Kept facilities and grounds safe and in compliance with state, county and city codes. Named “Employee of the Month” in June 2017 and earned high marks on performance reviews for work ethic, attention to detail and commitment to the school community. Coordinated with facility manager to clean building and grounds for church with approximately 450 members. Maintained cleanliness of sanctuary, offices, meeting rooms, kitchen, restrooms and gathering hall. Assisted with seasonal painting projects and loading/unloading of donated food, clothing and other goods. As a custodian, you know the importance of cleanliness and order. Your resume benefits from those things too. Not sure how to neaten it up? Get a free resume evaluation today from the experts at Monster's Resume Writing Service. You'll get detailed feedback in two business days, including a review of your resume's appearance and content, and a prediction of a recruiter's first impression. Monster's experts will show you quick and easy ways to make your resume shine.